Do you have music channels with your digital cable service such as Music Choice. Do you want to turn off the TV and just listen to the audio. Do you have loudspeakers and a receiver which provide richer audio than TV speakers. Do you want to listen to better sound from TV programs while viewing. Do you want to record songs from the music channels. 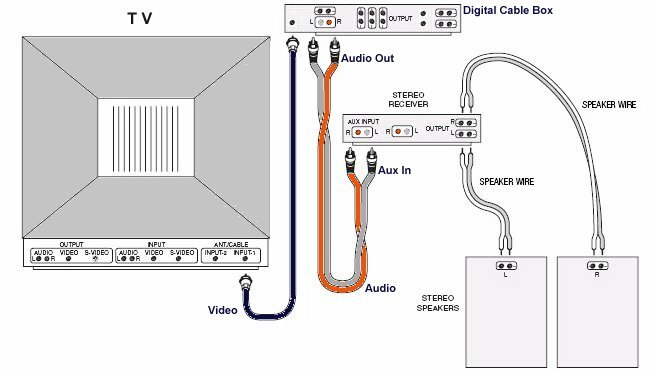 You have several connection options but the most simple hookup is to use standard RCA phono audio cables from the AUDIO OUT jacks on the cable box to the AUX INPUT on a stereo receiver. (3) Select the AUX IN on the receiver. (4) Loudspeakers are connected to the receiver or amp using speaker wires. You can turn off the TV when only selecting music channels.   How do I hookup my DVD player using component video?   How do I setup my DVD player for 5.1 surround sound?   How do I hookup my DVD player with a HDMI connection?